SILVERADO Country Band! E’ questo il nome della band italiana più popolare nell'ambito della musica targata “made in USA”! Una country band esplosiva che da oltre 10 anni si esibisce in Italia e all’estero. Con un repertorio che spazia dai grandi classici ai brani "new country", i SILVERADO raccontano la storia della "country music" . Seguiti dagli amanti di ballo Country e dagli “appassionati” del genere musicale, ogni serata con i SILVERADO è un successo di pubblico, travolto da questa alchimia tra musica e ballo, nell’atmosfera folkloristica tipica degli “Stati del Sud”. Del successo dei SILVERADO si sono occupati riviste e trasmissioni televisive specializzate in Country Music e Country life. Haag am Hausruck Austria (maggio 2013), Lincoln County Cowboy Symposium in New Mexico USA (ottobre 2014) Rock Country festival Sarganserland Svizzera (maggio 2015), Verzasca Country Festival Svizzera (agosto 2015), Klewnalp Country Festival Svizzera (luglio 2016), INTERLAKEN International Trucker and Country Festival (June 2018), Country Music Festival Schutzenhaus Albisgulti (March 2019). Tante le esperienze in studio discografico. Nel 2012 esce il primo CD, 10 brani editi, riarrangiati con il loro inconfondibile sound, poi nel 2015 registrano "Silverado Strings" in acustico, con il primo pezzo originale "Hold me". A dicembre 2015 registrano il secondo singolo "American Wonder" che viene presentato in occasione del Billy Bob's Texas Country Fair a Padova a fine gennaio 2016. Lo stesso anno registrano dal vivo il loro brano "Louisiana" e nel 2017 pubblicano il singolo "Central Hotel", con la partecipazione straordinaria di due stelle del firmamento texano: Donnie Price ed il vincitore di 2 grammy awards Jason Roberts. Nel 2018 il regista giapponese Hiroki Hayashi dirige il video clip di HOLD ME realizzato dagli studenti del master in Fine Arts and Filmmaking di Ca' Foscari (link al video). COUNTRY MUSIC - Una storia Americana: per la prima volta a teatro, attori e musicisti sullo stesso palco raccontano la storia della musica country attraverso la vita di un immigrato nel nuovo continente. Da un'idea di Esterita Vanin, drammaturgia originale di Andrea Stocchetti e Esterita Vanin, a cura di Paola Bigatto con gli attori BRUCE BOREHAM e CRISTIANO PAROLIN (Coproduzione Teatro Ca' Foscari - Silverado Country Band). 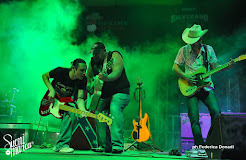 Venetian wonder, quietly starts in 2007, to spread in 2008 and finally explodes in 2009: it's SILVERADO New Country Band - That's the name of a group of musicians specialized in country music! The band is one-of-a-kind: the combination of Ester's personality, front woman and group leader, and the know-how of all her band members is simply explosive. To top it all, SILVERADO plays a never-failing repertoire ranging from the biggest among timeless classics down to the present hits in the US charts: the perfect mix for fans of country dance as well as for lovers of the genre. Each concert of SILVERADO is a success: the audience is overwhelmed by the typical 'southern states' style – excellent music and plenty of dancing. SILVERADO has played all major Italian events – e.i. Fiera Cavalli (Verona and Milan), Venice Country Show (Venice), Country Christmas (Pordenone), all main clubs of the genre in Italy and abroad as well as countless summer fairs and festivals giving between 50 and 60 concerts each year. INTERNATIONAL COUNTRY FESTIVALS: May 2013 Haag am Hausruck Austria, Lincoln County Cowboy Symposium, New Mexico USA (October 2014), RockCountryfestival Sarganserland CH (May 2015),Verzasca Country Festival CH (August 2015), Klewnalp Country Festival CH (July 2016), INTERLAKEN International Trucker and Country Festival (June 2018) Country Music Festival Schutzenhaus Albisgulti (March 2019). Cavallo Mania TV, Cowboy Magazine and Country Music Switzerland are just a few of the magazines and TV programs specialized in country music and country life which wrote about SILVERADO's success. SILVERADO in 2012 worked as well in a studio on 10 songs the band covered in its own, unmistakable way. The CD – available online at selected web radios – has quickly become a must among the best DJs mixing country music. In 2015 they recorded an acoustic album which includes "Hold me" their first single track. Then Silverado recorded other songs among which "American Wonder", "Louisiana" and "Central Hotel" featured by the Texans Donnie Price & the 2 time Grammy-Award winning Jason Roberts. SILVERADO is constantly evolving and is already working on many surprises. Stay tuned!